MADRID (AP) After hearing nonstop talk about Gerard Pique and his provocative celebration against Espanyol, Barcelona will be trying to get its focus back on Thursday’s Copa del Rey semifinal. Barcelona plays at Valencia, defending a 1-0 lead from the first leg as it bids to reach its fifth straight Copa final. Pique sparked controversy in a Spanish league match against the city rival last weekend, celebrating his late equalizer by telling the Espanyol crowd to be quiet. He later also criticized the club for losing its links to the city and for having a foreign owner, prompting a wave of criticism. Pique risks being suspended for his actions, and Barcelona has had to come out and publicly defend the player in the days leading up to the decisive match against Valencia. A draw at Mestalla Stadium will be enough to put Barcelona in the final and keep it on track to win its fourth consecutive Copa title. It’s not even clear if Pique will play because of an injury sustained after his goal celebration in the 1-1 draw against Espanyol. 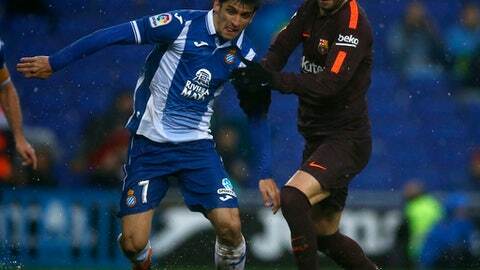 The veteran defender couldn’t avoid a hard tackle by Espanyol forward Gerard Moreno, who was upset with Pique’s celebration. Pique received a knock to his right knee and was listed as doubtful to make the trip to Valencia. Pique had made comments criticizing Espanyol before Sunday’s league match, and the crowd showed their disapproval by jeering him nearly every time he touched the ball at RCDE Stadium. Pique said some of the fans insulted his family throughout the match. It is not the first time the outspoken Pique has been surrounded by controversy. He is often jeered by fans when Barcelona plays away games because of his pro-Catalonia stance. Last year, after encouraging Catalans to vote in a disputed independence referendum, he was loudly booed by fans in Madrid after joining the Spanish national team at a training camp. Barcelona has faced a hostile environment at Mestalla in the past. In a league match last season, Valencia fans threw objects at Barcelona’s players while they celebrated a goal near the stands. Valencia and Barcelona met in the Copa semifinals two years ago, with the Catalan club winning 7-0 at Camp Nou Stadium in the first leg. It then held on to a 1-1 draw at Mestalla with its second-stringers. Since that 7-0 demoralizing defeat, Valencia has lost only three of its six matches against Barcelona, winning 2-1 at Camp Nou in a league game in 2016 and drawing 1-1 at Mestalla earlier this season. Third in the league, 18 points behind leader Barcelona, Valencia is trying to make it to the Copa final for the first time since 2007-08, when it won its seventh title after eliminating Barcelona in the semifinals.